In the long history of Western culture, it is given to very few to have an entire era named after them. Socrates sits within Antiquity, Leonardo da Vinci within the Renaissance; even Shakespeare has been subsumed into the ‘Elizabethan age’. That the ‘age of Goethe’ (Goethezeit) should have become a standard term for the years spanning the Weimar poet’s active life – roughly, 1770 to 1830 – suggests, then, his overwhelming importance to the German psyche. Without Goethe, one might say, the great tradition of high culture that characterises modern Germany would never have begun; without Goethe, the archetypes of the national imagination – the raging Werther, the ageing Faust – would never have come into being. How could one man accomplish so much? Among the many merits of Rüdiger Safranski’s masterly biography is that it explores the full range of Goethe’s achievements. Novelist and naturalist, statesman and poet, Goethe (1749–1832) made significant contributions to an astonishing array of disciplines. Not for him the narrow professional specialisations that would rapidly establish themselves in the decades following his death or the disciplinary boundaries to which lesser beings were beholden. At every new intellectual border he crossed, Goethe could announce, like Oscar Wilde but in earnest, that he had nothing to declare but his genius. Such confidence was rooted in his early success. 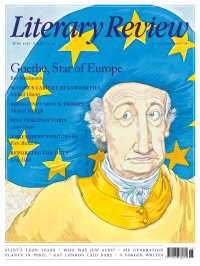 By the age of twenty-five, Goethe was the talk of Europe, the early drama Götz von Berlichingen (1773) – a Shakespearean reimagining of a knight’s misadventures during the Peasants’ War of 1525 – being rapidly followed by the international bestseller The Sorrows of Young Werther (1774). With a single shot to his head, the lovelorn Werther, in thrall to sentimental literature and in despair over his beloved Lotte, created a fashion for sensitive young men in yellow waistcoats. Indeed, so startling was the novel’s impact that, for the rest of his life, Goethe was best known as the author of Werther (at their famous encounter of 1808, Napoleon claimed to have read it seven times). Here as elsewhere, Safranski shrewdly identifies the Eros behind the art, depicting the young author transferring his affections from one married woman to the next. As Safranski’s work progresses, a pattern starts to develop that explains Goethe’s prodigious energy. The flipside to his enormous self-confidence was a recurring melancholy, a taedium vitae that suffuses Werther and re-emerges throughout Goethe’s writing. In order to combat such ennui, Goethe plunged himself into work: writing, Safranski suggests, was an exercise in cheering himself up. Time and again, on the death of a friend or family member, Goethe sought solace in his latest project; ‘striving’, the great Faustian verb of activity, came to define his vision of the human condition. As he observed of himself in 1797 (in a note written, not uncharacteristically, in the third person), ‘the centre and basis of his existence is a forever active, continuing poetic drive to develop himself inwardly and outwardly’. In 1775, this drive led Goethe away from his native Frankfurt to the duchy of Weimar. Appointed adviser to the inexperienced Duke Karl August, the charismatic Goethe quickly became the chief attraction of the court, Voltaire to the young duke’s Frederick the Great. Safranski has fun recounting the various contemporary nicknames for Goethe, inspired in equal parts by admiration and envy: for his older colleague Wieland, he was ‘the wizard’; for the wife of the duke’s tutor, he was ‘the postscript’. His arrival in the duchy marked the beginning of Goethe’s maturity; he soon settled into a rhythm that would characterise the rest of his long and highly productive life. The great age of Weimar classicism had begun. This also meant, however, that Goethe was becoming as much administrator as artist. Safranski is particularly good on the long stretches of Goethe’s life where he was in fact not writing. Determined to see himself as a man of action as well as of words, Goethe set about running the duchy – its army, its infrastructure – with his customary vigour. The famous ‘two souls’ that dwell within Faust’s breast take on a different meaning here. Goethe’s sense of self oscillated uneasily between literature and life, an experience he dramatised in the play Torquato Tasso (begun in 1780), in which the poet Tasso struggles against the court official Antonio. For eight long years, Goethe began numerous works, including Faust, Wilhelm Meister and Tasso – but finished almost none of them. Forms, by running my hand down the beautiful hips? See with a feeling eye, feel with a seeing hand. Following his return to Weimar, two primal events took place: the French Revolution and his encounter with Schiller. The political consequences of the former determined the course of the next thirty years; the intellectual consequences of the latter were equally far-reaching. After an initial meeting marked by envy and resentment (Schiller describes Goethe as a ‘proud, prudish woman whom you must get with child to humble in the eyes of the world’), the two writers grew increasingly close, notably following the founding of the journal Die Horen in 1794. Schiller’s death in 1805 marked another turning point in Goethe’s life, rapidly followed, in 1806, by Napoleon’s arrival in Weimar. The much-mythologised meeting in 1808 between emperor and author – ‘Voilà un homme!’, Napoleon is supposed to have said of Goethe – conferred in the latter’s mind a seal of sovereignty on his entire existence. ‘Nothing higher and more gratifying could happen to me in my whole life,’ Goethe reported to his publisher Cotta. Much of the last twenty years of Goethe’s life was dedicated to finishing projects that he had started long before, yet he was still capable of new beginnings. In 1809 he published Elective Affinities, a novel that applies the metaphor of magnetism to the chemistry of human relations; at the same time he turned to actual science, publishing his Theory of Colour in 1810. Goethe was determined to be taken seriously as a scientist, so it pained him greatly that the scholarly community largely ignored his anti-Newtonian ideas about the refraction of light. He had better luck with the West-Eastern Divan (begun in 1814), a memorable series of poems inspired by the Persian poet Hafez – as well, inevitably, as by his latest infatuation with a married woman. One final passion, this time for the seventeen-year-old Ulrike von Levetzow (Goethe was seventy-three), gave rise, in 1823, to perhaps his greatest late poem, the ‘Marienbad Elegy’. Beyond these various works, the chief preoccupation of Goethe’s final decade was Faust, the play that remains the supreme masterpiece of German literature. Faust had accompanied Goethe throughout his life: from the earliest sketches in the 1770s, through the publication of Part One in 1808, to intermittent attempts to shape Part Two, Goethe returned to the tale whenever he felt he was losing focus. From 1825 onwards, however, he worked on Part Two with renewed energy, his own advanced age mirroring that of the protagonist. Faust and Mephistopheles not only travel through Antiquity, but they also anticipate the dawning age of industrial modernity, with the prevalence of financial speculation and the emphasis on ineluctable ‘progress’. The devil may have the best lines, but it is the hero who encapsulates, once more, the spirit of striving so dear to the author. Less than a year after finishing Faust, Goethe was dead. Safranski has written an outstanding biography, one that can be enjoyed by both scholars and general readers. Concentrating on primary sources – principally letters, diaries, and the poet’s own records – he brilliantly captures Goethe’s perpetual incipience. If the life occasionally feels foregrounded at the expense of the work – the major texts are inevitably explored in relation to Goethe’s personal development rather than to his aesthetics – this is a small price to pay for such a vivid re-creation of the man. A mention, too, must be made of the translator, David Dollenmayer. He has boldly decided to translate all quotations from Goethe’s works and letters himself, rather than use existing translations. Occasional anachronisms aside – Goethe the ‘whiz kid’ – this works surprisingly well, giving a single, unified voice to a diverse body of work. Like Napoleon with his generals, Goethe has been lucky, on this occasion, with both his biographer and his translator. A compelling life has found compelling form.